Teach Your Pet to Avoid Areas in Your Home. Stop your pet from "Counter Surfing", waking the baby, getting into the trash or out of an entire room if necessary. The PetSafe Pawz Away Indoor Pet Barrier is a wireless dog fence you can use to keep pets out of certain areas in your house. No training and no installation, simply place the small transmitter in the areas you don't want your dog to be, put the collar on him and watch as he stays away from the protected areas. The transmitter will broadcast a radio signal adjustable up to up to a 6 foot radius (12 foot diameter). When your dog first enters this range he will receive an audible tone followed by mild stimulation that will increase the closer he gets to the transmitter. 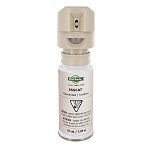 You can use as many collars and transmitters as you need. Solve frustrating pet problems with expert ease! I HAVE FOUND THIS TO BE THE MOST EFFECTIVE TRAINING TOOL TO TO KEEP YOUR PETS OUT OF AREAS THAT YOU DON'T WANT THEM GOING . I HAVE A VERY LARGE KITCHEN AND PREFER TO KEEP MY 2 PUGS OUT OF OTHER AREAS OF THE HOUSE , THIS PRODUCT HAS BEEN AMAZING !! NOW , I DON NOT EVEN HAVE TO TURN THE COLLAR ON OR THE DISC , I JUST PUT THE COLLAR ON AND THE DISC IS ON THE FLOOR IN THE HALLWAY AND THEY NEVER EVEN ATTEMPT TO LEAVE THEIR AREA .........WOULD RECOMMEND THIS PRODUCT TO EVEYONE TO USE AS A TRAINING TOOL WETHER YOUR POOCHES ARE YOUNG OR OLD . No more peeing in the wrong spot! "10 pounds of fluff called Sylvia, 4 yrs old, suddenly decided to pee under the dining room table. Big NO NO Wouldn't stop, no matter what. Then came RadioFence Two warning buzzes and one zap later... No more peeing under the dining room table. Effective Fast Bad behavior corrected gently. Have and will continue to recommend! But this indoor unit is only strong enough to correct small dogs and has a limited signal range. But the unit served my needs just fine!" This product works. Best deal for the price and we shopped around. We only have a VERY sneaky Puggle so cant comment for larger dogs, but it only took 2 shocks and she wont go within 10 feet of either base-not even for visitors at the door. Will still need to purchase one more base. Doesnt quite range as far as it says it does, we just keep it at maximum. It also came with bad batteries installed in the collar and we had to repurchase new ones, but bottom line, this product works. Whoo-hoo no more gates! Collar does not hold up well. My cat shredded the collar by scratching at it, to the point that it broke completely in two and fell off. Now I have to find a new one that will fit the receiver. And the collar has to fit quite tightly. I also had to turn the transmitter up all the way to keep the cat from going upstairs. What a great product at a great price. I put off getting new carpet for a long time because I thought you had to spend hundreds of dollars for Pet training collars, then I found Pawz Away online for about $50. I bought 2 and now I have no worries about my new carpet. Problem solved. This is a good product. I use it to keep my 7 yr old Weimeraner out of the kitchen when we are not at home. I wish I would have seen this product years ago. Works as advertised. This is my second unit as the first collar broke at the contact point for the battery. This device is excellent. It really has enhanced our puppy's training. It works very quickly to teach her which areas in our home are a "no-no", and which ones she's allowed to go into. Our cat is especially appreciative! Thank you for your product it really free certain areas from our cat who would not stop the bad behavior. We had tried everything that was told but nothing worked until we bought this product. I highly recommend it. Works great! 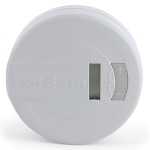 Keeps our dogs off living room carpet and furniture.The only problem is that the collar batteries are difficult to change and run down very quickly. Also the "on, off, open" lettering on battery cover wears off right away, so you have to guess. We've purchased more than one, so definitely find it useful and company stands behind product which is a huge plus! This product works amazingly just like it says. Our jack russell gets into anything and everything and this has kept him in line. I ordered more once i found out how great they are. Only problem is that the perimeter doesnt seem the same distance all the way around the transmitter so you have to mess around a little to get it how you need it. Highly recommend to anyone who is trying to keep pets off furniture, tables, and out of trash cans or just entire rooms! It stopped my dog in her tracks. She only wears it at night or when we are gone. No more missing bread or cat food. This was the best and easiest way to train my dog to stay out of things. Mainly our bread, it only took a couple of times and she stays away from it. I received my product when it was promised. Received what was promised. The batteries that were included were dead when it arrived, after a trip to the store all was well. I am using my zone alarm to keep my dogs out of the litter box and the cat food, works great. I have wall mounted using command adhesive strips since i didn't want to damage a cabinet. Dogs definitely know when they don't have the collar on. Would be nice to be able to order collars in sizes, I had tons of excess to cut off for my small dogs. All in all a very good training product. 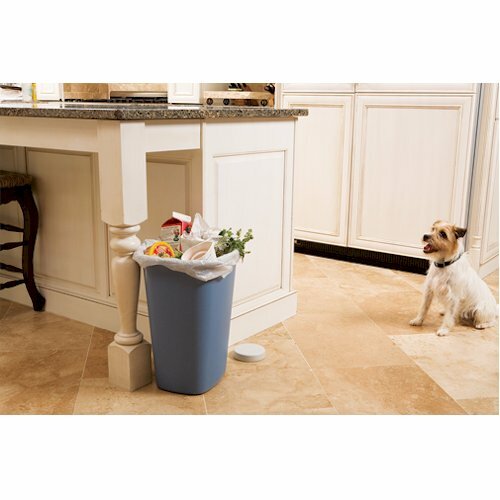 Q: can i get an additional collar with the $49.00 kit...I have 2 dogs that are always in the trash in the kitchen ? Yes, you can add additional collars. 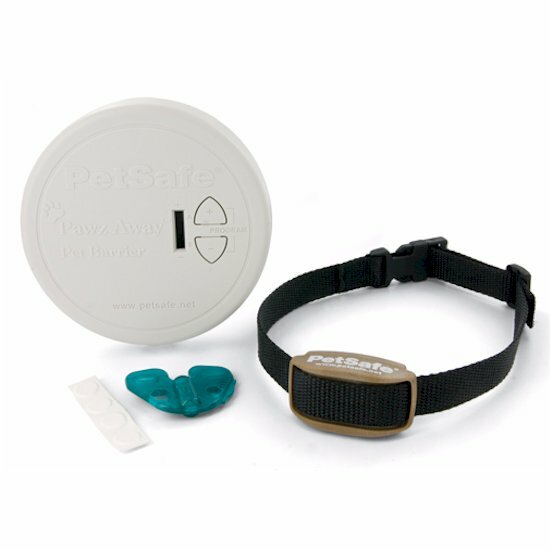 The PetSafe Pawz Away Indoor/Outdoor Collar - PWF00-13664 will work with both the Pawz Indoor & Outdoor Barrier. Q: I have two cats and two doors I want to protect. Do they work on the same frequency? A: Yes they do work on the same frequency and can be used together to contain multiple areas or be combined to contain a larger area. Q: If I need multiple transmitters, what do I buy? I see you have this one, and then I see a transmitter one. I'm not sure which ones I need. Also, how close do the dogs need to come for it to start warning them? The range is adjustable up to a 6 foot radius.